One of the big benefits of Project Fi is the ability to place Wi-Fi calls. What that means is that if I have a call come in to me or I place a call and my Wi-Fi signal is measured as being stable and fast enough by Fi, the call will be placed over my Wi-Fi connection instead of cellular. So what is the advantage of this? Think about a time where you had plenty of Wireless signal but no cellular signal. But even in a scenario where you have ample cellular coverage and Wi-Fi coverage, Fi will chose the Wi-Fi first based on the principle of Least Cost Routing. It costs Google less (remember, your talk minutes are free from Fi but Google still pays for any minutes you use) to place a call over wireless than cellular. While I covered Wi-Fi calling in my review of Project Fi, on this particular subject I was a bit vague in showing exactly how this worked. Hopefully this post will clear things up for you. To be clear, I’m not talking about calls made via Hangouts. That’s a whole different subject. No, I’m talking about calls placed with the Google Dialer app that is built into your Nexus device – just like you would if you were using cellular. So how then can you tell if your Fi call has gone over Wi-Fi? It’s pretty clear and I’ll show you after the break. Normally when you place a call to someone on cellular, you see that person’s contact information and the amount of time you have been on the call. Fundamentally, it doesn’t look much different on Wi-Fi but there is one key thing that shows up for those calls: Your Wi-Fi’s SSID. Take a look at the screenshot to the right. This was a call that I made from my Fi enabled Nexus 6 to my work phone number. Note above my name you see a Wi-Fi signal icon and the name “Winterfell”. Winterfell (yes I’m a Game of Thrones fan) is my network’s SSID. This is how I know that this call took place over Wi-Fi. If you look closely, you will note that that is the only difference between a cellular call and a Wi-Fi call. 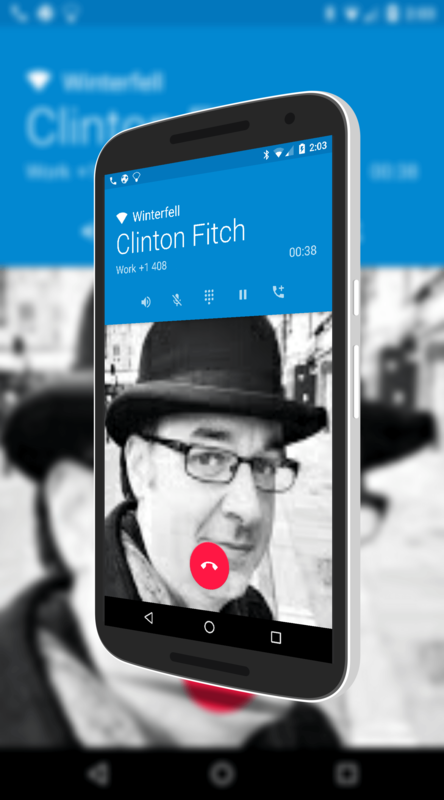 Otherwise, the Google Dialer app looks the same. Another common question that Fi users have is if it is possible to force all calls to go over Wi-Fi instead of cellular. The answer is yes but I’ve yet to see a use case where this would be needed. Again, Fi determines the best route and if cellular isn’t available then it routes over Wi-Fi. Given that you don’t pay any international roaming charges with Fi, I don’t see needing to force Wi-Fi only either. But yes, you can do it. On your Nexus device, put your phone into Airplane mode then turn on the Wi-Fi on your Notification panel. Airplane mode shuts down the cellular signal but by turning on Wi-Fi, you essentially enable Wi-Fi only calls. Thanks for visiting the site! I’m glad it has been helpful. Fi is going to look at both the mobile network and the wireless network to make a call. It is looking at both the signal strength and it is look at the quality of the signal. As you know, you can have a strong Wi-Fi signal yet have no throughput. That’s what Fi looks at too. Fi is going to prefer whichever is going to give the best call experience and yes, that is often mobile but not always. That said, Wi-Fi calling is very much a subject to conditions where you are making the call. Indeed, putting the phone into Airplane mode may actually be part of the problem as Fi can’t “learn” all conditions. I know it sounds painful but it may be best to let it have both mobile and Wi-Fi up to so Fi can learn your networks. Thank you Clinton. You explained it very clearly for me. I was concerned because one of my replies when I put it out to the community was,”it may very well be a software problem’ .